In its resolution establishing the IIIM (A/71/L.48) in December 2016, the United Nations General Assembly called upon various bodies, including Syrian civil society, to cooperate fully with the IIIM, in particular to provide the IIIM with any information or documents these bodies may possess, as well as any other forms of assistance relevant to the IIIM mandate. Over the past year and a half, Syrian civil society has worked diligently to support the IIIM’s work. Civil society has introduced the Syrian people to the mechanism, leading to a greater understanding of the IIIM’s mandate. This process included holding three consultative meetings with the mechanism’s team in Lausanne, Switzerland, recently culminating in the signing of a protocol of cooperation between the IIIM and Syrian civil society organizations. This protocol aims at ensuring mutual understanding between the parties in terms of opportunities for cooperation, furthering the parties’ common objective of ensuring justice and accountability for victims of crimes committed in Syria. The signatory organizations look forward to working with the mechanism’s team to advance the justice and accountability agenda for all victims in Syria and would like to encourage international and local organizations to cooperate with the mechanism and support its mandate. The Syria Justice and Accountability Centre (SJAC) is a Syrian-led and multilaterally supported nonprofit that envisions a Syria where people live in a state defined by justice, respect for human rights, and rule of law. SJAC collects, analyzes, and preserves human rights law violations by all parties in the conflict — creating a central repository to strengthen accountability and support transitional justice and peace-building efforts. SJAC also conducts research to better understand Syrian opinions and perspectives, provides expertise and resources, conducts awareness-raising activities, and contributes to the development of locally appropriate transitional justice and accountability mechanisms. 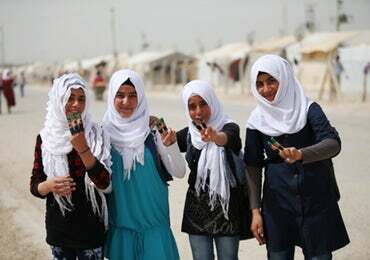 Contact us at info@syriaaccountability.org. On April 7th 2018, reports started coming in from medics that civilians were coming in for treatment displaying symptoms of a chemical attack. Shortly after, video and pictures surfaced showing tens of dead bodies of women and children, along with scenes of families who suffocated in bunkers that became gas chambers after the attacks with no escape. Final death tolls reported 55 civilians dead and at least 1,000 injured. On April 7th 2018, reports started surfacing that civilians were coming into Syrian hospitals displaying symptoms of a chemical attack. Shortly after, video and pictures surfaced showing tens of dead bodies of women and children, along with scenes of families suffocated in bunkers that became gas chambers after filling up with chlorine gas. Final death tolls reported 55 civilians dead and at least 1,000 injured. ​After being captured by rebel forces in 2012, government forces counterattacked the area of Eastern Ghouta in May 2013, beginning a siege. Government forces then imposed restrictions on humanitarian supplies to Eastern Ghouta while simultaneously striking the area with air artillery. In August 2013, Eastern Ghouta witnessed the deadliest chemical attacks since the Iran-Iraq war. Government forces launched rockets in the area containing sarin gas that killed over 1,700 people. Civilians never recovered and lived mostly on aid from outside sources. Despite de-escalation agreement attempted in late 2017, the situation escalated in November. Between the start of heavy fighting in November 2017 up until the escalation through February 2018, the SNHR reported that 1,121 civilians had lost their lives, including 281 children and 171 women. There were more than 18 attacks on medical facilitates, 32 attacks on local markets and 11 attacks on schools. The SNHR also reported that chemical weapons and four cluster munitions were used by Syrian government, and government backed forces. ​In March, government forced broke up Eastern Ghouta, but Douma city was controlled by Jaysh al-Islam, who was holding onto the area and not evacuating like other rebel groups. Negotiations with the group stalled on April 6th 2018, resuming air strikes. On April 7th 2018, two attacks took place in Douma City. One in north-western Douma on Saada Bakery, and the next on Martyrs Square according to the Violations Documentation Center (VDC). Medics began reporting they were treating civilians with symptoms consistent with those of chlorine gas, and reported strong chlorine odor. Symptoms included acute dyspnea, conjunctivitis, and oral foaming. ​Aid groups and eyewitnesses immediately began blaming the Syrian regime and their allies for the chemical attack. Many agreed the attacks were aimed to break the will of rebel groups so they would let go of the area and evacuate. Groups also noted that Regime forces and allies have used chemical weapons numerous times during the seven year war. The UN found that three of these occasions included the use of chlorine gas. Shortly after the attacks, Russian military operatives announced that the Syrian Government was in full control of the town as rebels controlling the area surrender. On April 12th, it was announced that the fact-finding team from the Organization of Prohibition of Chemical Weapons was on its way to Syria to investigate the chemical attacks. The international community was quick to denounce the attacks, claiming action would be taken against the Syrian regime and their allies. On April 14th, 2018, the US, backed by Britain and France led air strikes against Syria, targeting area they claimed were vital to Syria’s chemical weapons program. Shortly after the air strikes, the US, France and Britain laid out evidence that the chemical attacks were perpetrated by the Syrian Regime. They cited eyewitness accounts of government helicopters in the area, and accounts of the same helicopters taking off from the nearby airfield. The future of Douma city and Eastern Ghouta is unclear as the investigation by the OPCW in still underway. The small agricultural town of Eastern Ghouta on the outskirts of the capital city of Damascus, is home to over 400,000 people that are still in dire need of aid and medical attention after the chemical attacks. ​After being captured by rebel forces in 2012, government forces counterattacked the area in May 2013, beginning the siege on Eastern Ghouta. Government forces then imposed restrictions on humanitarian supplies to the area while simultaneously striking the area with air artillery. In August 2013, Eastern Ghouta witnessed the deadliest chemical attacks since the Iran-Iraq war. Government forces launched rockets in the area containing sarin gas that killed over 1,700 people. The area never recovered and lived mostly on aid from outside sources. Despite de-escalation agreement attempted in late 2017, the situation escalated in November. Between the start of heavy fighting in November 2017 up until the escalation through February 2018, the SNHR reported that 1,121 civilians had lost their lives, including 281 children and 171 women. There were more than 18 attacks on medical facilitates, 32 attacks on local markets and 11 attacks on schools. The SNHR also reports that chemical weapons and four cluster munitions were used by Syrian government, and government backed forces. ​In March, government forced broke up Eastern Ghouta, but Douma city was controlled by Jaysh al-Islam, who was holding onto the area and not evacuating like other rebel groups. Negotiations with the group stalled on April 6th 2017, resuming air strikes in the area. On April 7th 2017, two attacks took place in Douma City. One in noth-western Douma on Saada Bakery, and the next on Martyrs Square according to the Violations Documentation Center (VDC). 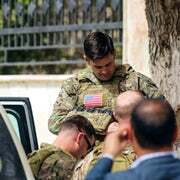 Medics began reporting treating civilians with symptoms consistent with those of chlorine gas, and reported strong chlorine odor. Symptoms included acute dyspenea, conjunctivitis, oral foaming and miosis. ​Aid groups and eyewitnesses immediately began blaming the Syrian Regime and their allies for the chemical attack. Many agreed the attacks were aimed to break the will of rebel groups so they let go of the area and evacuate. Groups also noted that Regime forces and allies have used chemical weapons numerous times during the seven year war. The UN found that three of these occasions included the use of chlorine gas. Shortly after the attacks, Russian military operatives announced that the Syrian Government was in full control of the town as rebels controlling the area surrender. On April 12th, it was announced that the fact-finding team from the Organization of Prohibition of Chemical Weapons was on it’s way to Syria to investigate the chemical attacks. The international community was quick to denounce the attacks, claiming action would be taken against the Syrian Regime and their allies. On April 14th, 2017, the US, backed by Britain and France led air strikes against Syria, targeting area they claimed were vital to Syria’s chemical weapon program. Shortly after the air strikes, the US, France and Britain laid out evidence that the chemical attacks were perpetrated by the Syrian Regime. They cited eyewitness accounts of government helicopters in the area, and taking off from the nearby airfield. The future of Douma city and Eastern Ghouta is unclear as the investigation by the OPCW in still underway. The small agricultural town of Eastern Ghouta on the outskirts of the capital city, is home to over 400,000 people that are still in dire need of aid and medical attention after the chemical attacks. Join Syria Deeply on Monday, April 16, at 11:00 a.m. ET (4:00 p.m. CET) for a special session of Deeply Talks, covering the fallout of the joint U.S., U.K. and France strike in Syria, and what it could mean for the conflict at large, the welfare of civilians, the persistence of ISIS and jihadi groups and the growing footprint of Iran and Russia in Syria. In a 30-minute live conversation, our editors Alessandria Masi, Lara Setrakian and Hashem Osseiran will discuss the motivations behind the first coordinated action by western governments against the Syrian government targets, whether or not it could deter the future use of chemical weapons against civilians and the strike’s potential impact on relations between Russia and the U.S.
To RSVP and receive dial-in instructions, click here. Please send us your questions and comments you would like us to address in the discussion. You can respond to this email or tweet @SyriaDeeply using the hashtag #DeeplyTalks. Copyright © 2018 News Deeply, All rights reserved. Welcome to Syria Deeply’s weekly summary of our coverage of the crisis in Syria. Suspected Chemical Attack: A suspected chemical attack in the town of Douma killed dozens of people late Saturday night in the Eastern Ghouta suburbs of Damascus. The Syrian Civil Defense (SCD) said they documented at least 42 fatalities, while the Syrian Observatory for Human Rights put the death toll at 80, including 40 people who reportedly died from suffocation. More than 500 patients being treated in medical facilities in Douma reported symptoms compatible with exposure to poison gas, including difficulty breathing, foaming at the mouth and burning eyes, according to a joint statement released by the SCD and the Syrian American Medical Society. Activists and medics blamed the Syrian government for the attack, but Damascus denied allegations, saying they were “fabrications” by the Jaish al-Islam rebel group. The United Nations Security Council met on Monday to discuss the situation in Douma. The U.S. circulated an updated version of a draft resolution calling for a U.N. inquiry into chemical weapons use in Syria that Washington had initially put forward last month, according to Reuters. Missile strike: Russia and Syria have accused Israel of launching a missile strike on a Syrian airbase near Homs on Monday. As of Monday afternoon, Israel had not confirmed nor denied the reports. At least 14 people were killed in the strike on the Tiyas, or T-4 base, including members of Iran-backed paramilitary groups, Reuters reported. At least two Iranians were among those killed, the semi-official Iranian Fars news outlet said, according to Reuters. 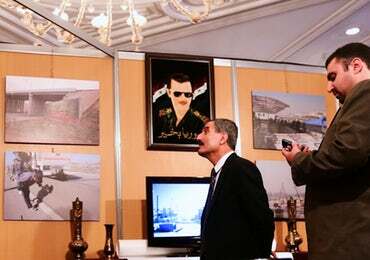 T4 is one of the Syrian army’s largest bases, and is allegedly also used by Iranian and Iranian-allied militias. Russia’s defense ministry said that two Israeli fighter jets launched eight missiles on the T4 air base from Lebanon’s airspace. Syria shot down five missiles, and the remaining three hit the western part of the air base, according to Moscow. The Lebanese army confirmed that four Israeli warplanes had violated its airspace on early Monday, flying in the direction of the Syrian border, but did not specify whether the jets were responsible for the strike on T4. Syria initially accused the U.S. of carrying out the strike, as it came after Trump’s “big price to pay” warning for the Douma attack. Syrian state media called it an American “aggression.” U.S. officials denied responsibility. Rebel evacuations: Jaish al-Islam, the last rebel group in Eastern Ghouta, began to exit the town of Douma on Sunday, in the first phase of a Russian-backed evacuation agreement, Reuters reported. Dozens of fighters from Jaish al-Islam and their families were bussed to the northern city of Jarablus after striking an evacuation deal with the Syrian government. Almost simultaneously, hostages freed by Jaish al-Islam arrived at a government-held crossing. Both developments are part of an evacuation deal brokered on Sunday between the government and rebels, with mediation from Russia. Under the agreement, the Syrian government grants rebels safe exit to northern Syria in return for the release of hundreds of hostages and prisoners held by the group. The deal also grants an offer of reconciliation for those rebels who wish to stay in Douma. Citing the Russian RIA news agency, Reuters said that Jaish al-Islam will evacuate Douma in two batches. Syrian state media said the rebels will be evacuated within 48 hours. If completed, the complete evacuation would give the government complete control of Eastern Ghouta. Construction has begun in the Basateen el-Razi district in southwestern Damascus, under a government development plan. Experts warn though that construction efforts are not geared towards repair and recovery. An estimated 550,000 Palestinian refugees registered in Syria are now facing secondary displacement due to the conflict, and many of them are facing deteriorating conditions and a protection gap in host countries, writes humanitarian expert Hanan Elbadawi. Before the U.S. pulls out of Syria, Washington needs to address a governance gap left in some former ISISterritories. Otherwise, marginalized Arab communities will likely ally with the Syrian government or extremist forces, writes Emily Burchfield of the Atlantic Council. We are always looking for new writers, experts and journalists who are covering the crisis in Syria and are interested in writing about a variety of topics. Please send us your ideas, story pitches and any other thoughts about our coverage via email, Twitter or Facebook. You received this email because you’re signed up to receive updates from us. Click here to unsubscribe. Copyright © 2017 News Deeply, Inc. All rights reserved. On March 9, the UN Commission of Inquiry (COI) on Syria released a new report, ‘Detention in the Syrian Arab Republic: A Way Forward.’ The report offers an overview of the detainee crisis in Syria: tens of thousands of Syrians held with no due process, families with no knowledge of their loved ones, and prisons where sexual violence and extrajudicial killing are rampant. In addition to accusing several parties to the conflict of committing crimes against humanity and war crimes, the report makes recommendations for how to address the suffering of detainees and their families through the UN-led negotiation process. 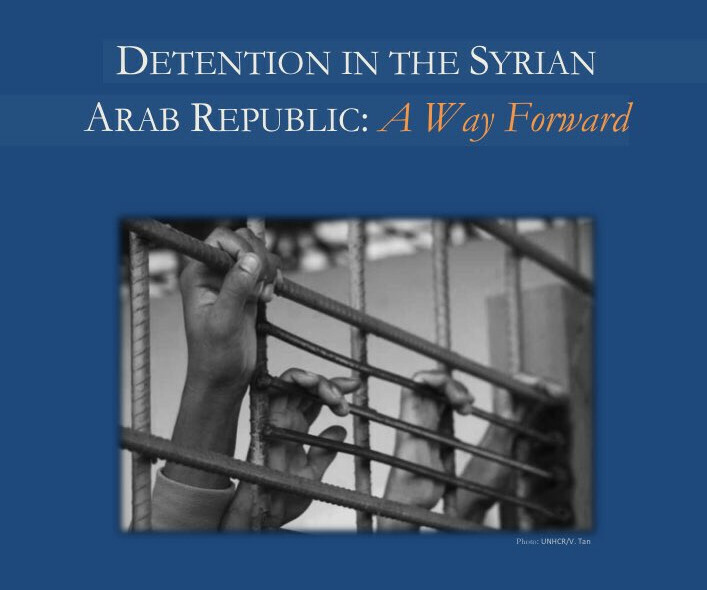 Indeed, Syrian civil society has long demandedthat the issue of detainees be central to negotiations, and the report endorses the notion that concrete proposals on the detainee issue could not only address the immediate needs of victims but also further the negotiations themselves.